Q. I know it's ridiculous to think of an "Indiana Jones" movie without snakes, but can you tell me if there are a lot of snakes in the movie? My wife has a really extreme phobia of snakes, but we would like to see it. Is it loaded with snakes or is there just one part with the extremely large snake? Is there a cue I could give my wife to tell her it is time for a restroom break or should I simply sneak out and see this one on my own? Any insight you could give me would be much appreciated. Justin Keith, Statesboro, Ga.
A. 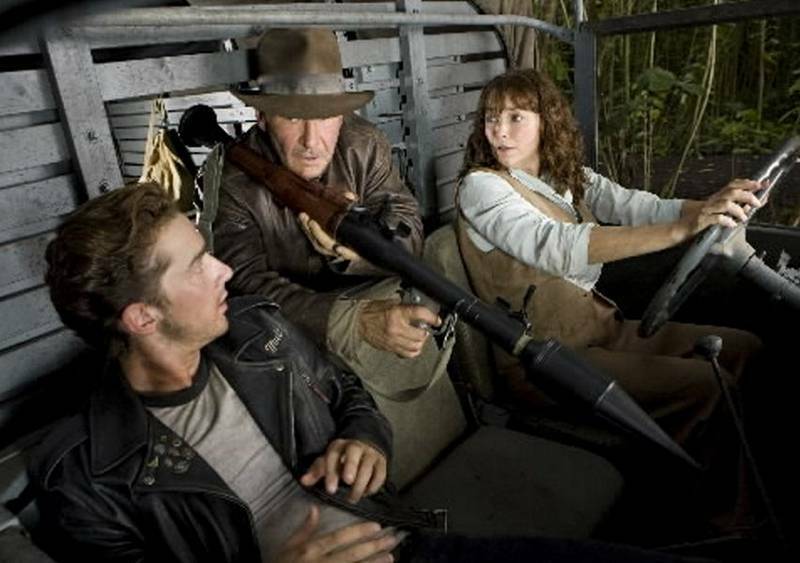 Not snake-heavy as "Indy" movies go. Besides, nothing a snake could do would equal the experience of being pulled alive into an anthill of giant man-eating ants. Q. I am 14 years old, and I personally love great movies, but I can't get friends that are my age to sit down and enjoy these classics with me. They claim they are boring. They didn't even like "The Godfather," stating, and I quote, "There was, like, no action." I was wondering, is there a certain age where people are suddenly awakened and realize they enjoy great movies -- and if so, why is it that younger people tend not to like the classics? Randy Rosdahl, Gastonia, N.C.
A. I think it has something to do with how interested you are in other people in general. Many of the truly great movies involve a close look at human life and behavior. To appreciate them, you have to be able to step outside yourself and empathize with someone else. That's the opposite of instant gratification. Some of your friends may not have reached that level of maturity. Some never will. Q. You first proposed the idea of fan-created do-it-yourself audio commentary tracks for movies. Lots of people have taken you up on it. Even professionals have been getting into the act, with the producers of TV shows like "Battlestar Galactica" or "Doctor Who" releasing downloadable commentary MP3s meant to be viewed against the taped show. And the "MST3K" gang has even started doing them with RiffTrax. Do you feel gratified to have started this movement, and how often do you have the chance to sample the fruits of your suggestion? By the way, I also did a couple myself, "Castle of Cagliostro" and a Robotech episode. Chris Meadows, Springfield, Mo. A. It seemed like a good idea at the time, and occurred to me a day after I obtained my first sound-input mike. I've tried a couple. In making your own track, you have to fight the tendency to simply describe the action ("Now she steps through the portal") and talk about what's happening ("There is a dissolve here that reveals another dimension"). A. In the area of transgressive violence combined with impressive artistry, I'd recommend Ki-Duk Kim's "The Isle." In my review, I wrote: "When the South Korean film 'The Isle' played Sundance in 2001, there were gasps and walkouts. People covered their eyes, peeked out and slammed their palms back again. I report that because I want you to know: This is the most gruesome and quease-inducing film you are likely to have seen. You may not even want to read the descriptions in this review. Yet it is also beautiful, angry and sad, with a curious sick poetry, as if the Marquis de Sade had gone in for pastel landscapes.' "
Q. My wife and I recently saw "Before the Devil Knows You're Dead" on video, and while we greatly enjoyed it, there was one aspect that bothered both of us: Philip Seymour Hoffman and Ethan Hawke play brothers involved in a botched robbery. Our problem is that while both men are very good actors, they hardly look like members of the same species, let alone siblings. I think this incongruity prevented us from completely getting into the story and marred what was otherwise an excellent film. I was surprised that in your review you appeared to find the physical differences between the actors one of the movie's positive qualities, rather than one of its few flaws. Am I missing something here, or are you cutting the filmmakers a break because they did pretty much everything else right? Joe Schwind, Martinsburg, W.Va.
A. Siblings often do not resemble each other, but you're correct, this one is a stretch. I think it helped director Sidney Lumet to more completely create two characters who are fully at odds with each other. A. Not many will know Mutt's first appearance is a direct steal from Brando in "The Wild One" (1953). There's a movie I'm surprised hasn't become more of a cult favorite. The Brando revolution has been so completely absorbed by film actors that it's hard to explain how his emergence was such an earthquake. Q. Two events have recently led me to ponder where the cinema intermission has gone. At a screening of "Grindhouse," the natural gap between films was a nice break in such a long and intense experience. The second was when I was viewing a DVD of "2001: A Space Odyssey"; there was a pause informing us of the "Intermission," the only time I have seen such a feature on any DVD. A. "Road-show" movies in the 1970s routinely had intermissions, which served the same purpose as intermissions in the theater or opera. They were an opportunity for the audience to do some bonding, measure the experience so far, visit the W.C., have a drink or a smoke and, in general, tune up for the second half. It was widely rumored that during the intermissions for "2001," potheads would mingle with the paying audience, drift into the theater without tickets, and stretch out on the carpet in front of the screen to more fully experience the sound-and-light extravaganza. Today's exhibitors would hate intermissions because they reduce the number of times a film can be shown in a day.